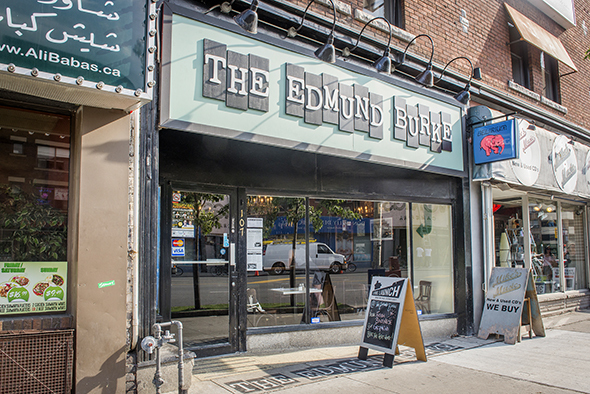 The Edmund Burke at Broadview and Danforth was formerly the German gastropub Das Gasthaus - yes, the one that was supposed to be raffled off . 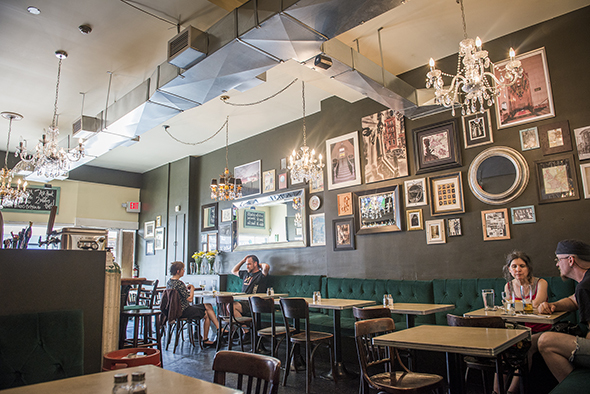 No, husband-and-wife owners Russell Piffer and Ginger Robertson were not the winners of that questionable contest ; instead, they approached the building's landlord to take over the space and succeeded. Robertson and Piffer have lived in the neighbourhood for 25 years, and after having worked as front-of-house staff in the food and beverage industry themselves, they decided to open a local spot of their own. They recruited Robertson's brother John, a seasoned chef ( The Westerly , The Big Carrot , Kultura ), to come up with the food menu, keeping things in the family. 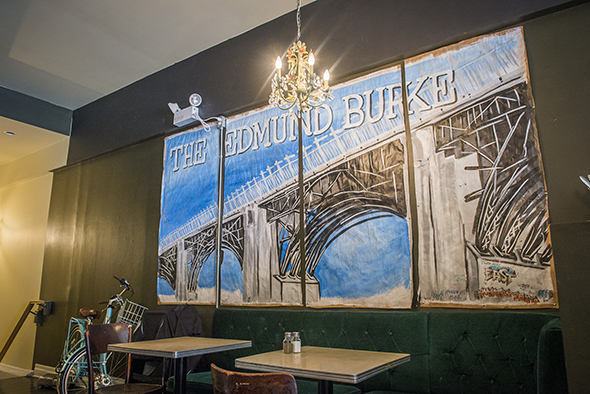 Named after the architect behind the iconic Bloor Viaduct nearby (and not the Irish statesman and philosopher ), this cozy gastropub pays tribute to the history of this area not only in name, but also through its decor. A mural-sized likeness of the viaduct by local street artist Victor Fraser is up on a wall in the back, as is a portrait of Michael Ondaatje, who wrote about the building of the bridge in his novel In the Skin of a Lion . Prints from the Toronto Archives of this historical building (it was once Playter Hall) dating back to 1908 hang up front. While the chandeliers and furniture have carried over from Das Gasthaus, Robertson stripped and refinished the bar herself and had a custom draft tap made from an old industrial black iron gas pipe. 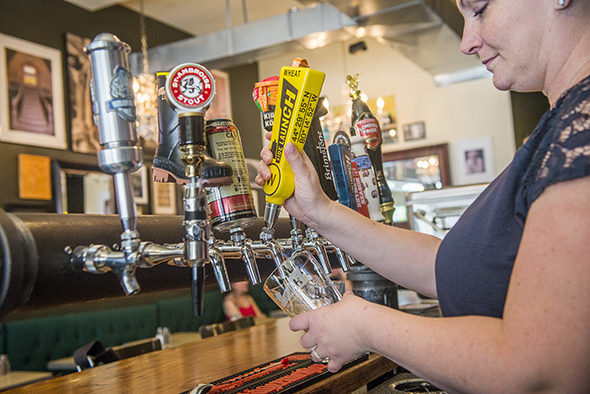 There are 12 beers on tap ($7-$8 for 16-20oz), with 10 craft (including Side Launch Wheat, GLB's Canuck Pale Ale and Brimstone Brewing Company's Sinister Minister) and a couple of imports (London Pride, Delirium Tremens). A few reds and whites are available by the glass ($7.50 each) and the well-stocked bar offers reasonably priced cocktails ($6.50-$10). 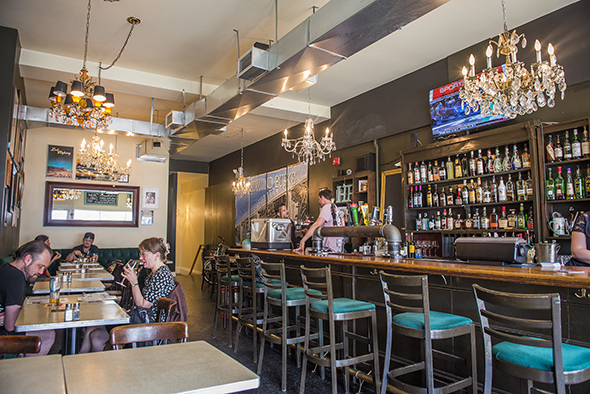 Hearty gastropub fare here (plus weekend brunch) uses local ingredients whenever possible, including bread from Dough and fish from De La Mer just down the street. 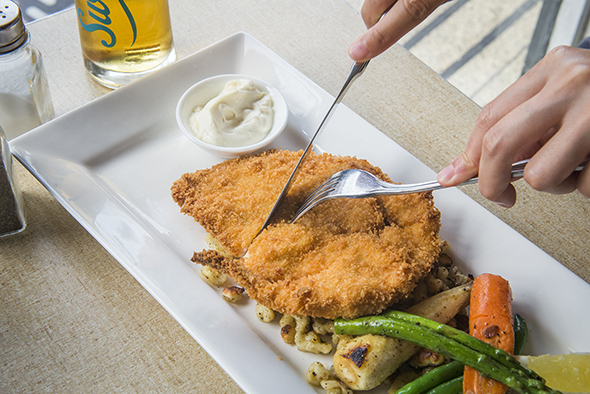 They've kept chicken schnitzel ($16) on the menu, with the intention of serving an improved version of it. I never tried it at Das Gasthaus, but this one is surprisingly light and crisp yet satisfying, and it comes on a bed of peppery brown butter sage spaetzle accompanied by extremely fresh-tasting seasonal vegetables and a lemon aioli dip. 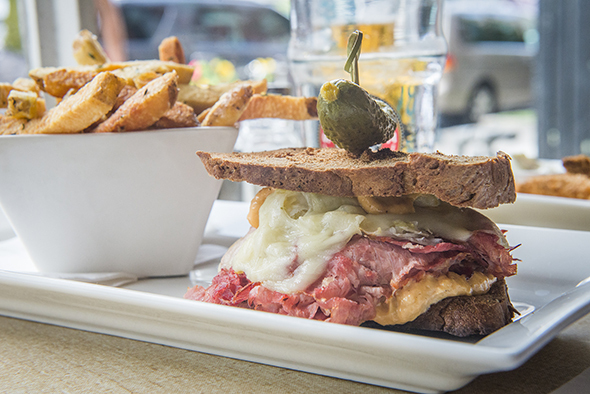 The classic Reuben sandwich ($16) contains tender corned beef, Swiss cheese, sauerkraut and Russian dressing (the latter two house-made) on rye, topped with a pickle. It comes with herbed fries or salad and we get the thick-cut fries, which are salty and addictive. I'm not exactly sure what makes the Chicago-style beef burger ($16, +$2 with aged cheddar) Chicago-style, but it's a tasty one. 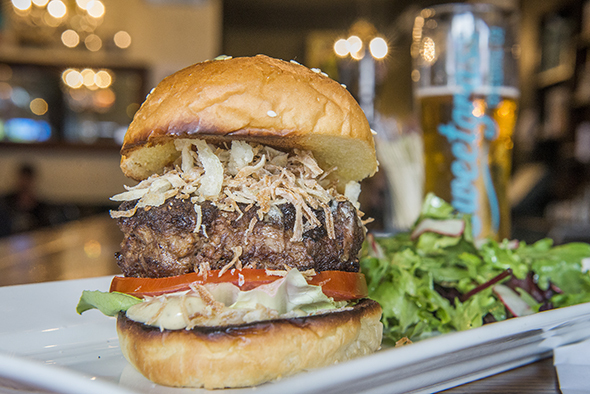 Served on a sesame brioche bun with lettuce, tomato, aioli and crispy frizzled onions, it takes a while to prepare as the thick house-made patty is braised in the oven. It has a nice height to it, yet not so overwhelming that it's impossible to eat. Regulars come here to catch games on the flatscreen, and since this place is right by the Danforth Music Hall, it's also perfect for pre- or post-concert hangs. It appears Robertson and Piffer have created a pretty ideal addition to their neighbourhood.